Pui/Poi/Pohi/Valchi or the Ceylon Spinach/Malabar Spinach are all but different names for this leafy Spinach like Green “fast-growing, soft-stemmed vine, reaching 10 m in length. Its thick, semi-succulent, heart-shaped leaves have a mild flavour and mucilaginous texture.” (Wiki). The Scientific name for the Pui is Basella alba. You can read more about it in the Herb Society of America. I had been having a steady supply of the mentioned greens all of last year from a dear friend of ours, who happens to grow almost everything in his back yard. What I did was take some of the unused stiff stalks & planted them in a pot indoors (This year they have been planted outside). They have been growing wild creeping & crawling into nook & corners & looking pretty too! The leaves, stalks & the seeds can all be cooked. Tear off the leaves, break the pliable stalks. The seeds are soft but slightly crunchy – slightly nutty while they are green & pink, however they turn really hard when they are ripe & purple. Discard these or sow them in the veggie patch. The greens can be washed chopped & frozen for later use. 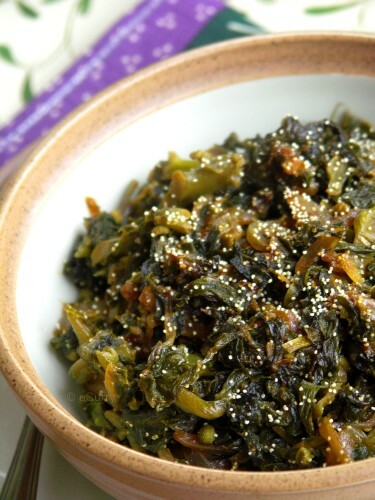 In the Eastern regions (Bengal & Assam) of India, Pui Saag (saag=any edible leafy greens) are cooked with a lot of other vegetables in to a dish called “chorchori” (dry fry where the vegetables remain distinct) or “Ghonto” (almost same as the chorchori but this one is stirred a lot while cooking) , or they are blended into a very unique combination of the greens, variety of vegetables & shrimp, called Pui Chingri (chingri = shrimp). What I have done is a very simple recipe that my mom & my grandmom would make. It is a stir fry with a lot of flavor of garlic, almost caramelized onions and a sprinkle of poppy seeds. Add Oil in a flat pan/skillet. Add the chopped garlic & heat the oil. Allow the garlic to heat with the oil, this allows the flavor of the garlic to be infused in the oil. When the oil heats up, you will see the garlic sizzle. Do not let them turn brown. Add the Onions & the Green Hot Pepper. 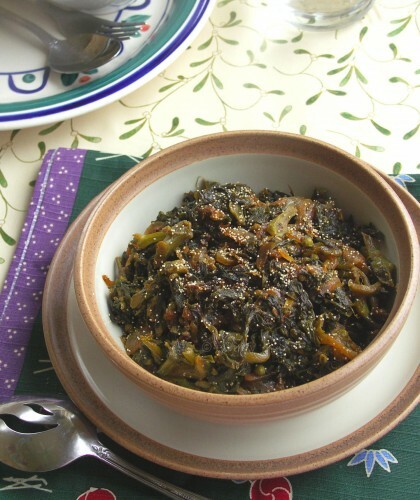 When the Onions are soft & translucent & start to caramelize & turn brown, add the Pui Greens. The greens will release a lot of water. Cook till the water evaporates & the color changes from the bright green to dark green. When most of the water evaporates, increase the heat & Stir Fry till all the water dries off, & you hear the sizzle. Sprinkle the poppy seeds on the top & toss to combine. Home grown & cooked, this goes to the HOTM hosted by Michelle of the Accidental Scientist. The theme this time is The Locavore. May 16th, 2009 | Category: Dry Fries, Sides & etc. The dish looks delicious soma…never tried pui before…do we really require 3 tbsp of oil? I had them growing in the garden last year. Like you said the flowers are really pretty. I bet down there in Texas they stay alive most of the year? Don’t they? This stir fry looks delicious. I make this all the time but never added poppy seeds, coconut yes. oh this is a beautiful way to eat thjose greens ! nice recipe. we call this as teega bacchali in Telugu and your recipe is very mew to me. This is a new dish for me, looks really healthy and yummy too. I love any kind of green, and it always makes me hungry to see it… Looks so tasty! 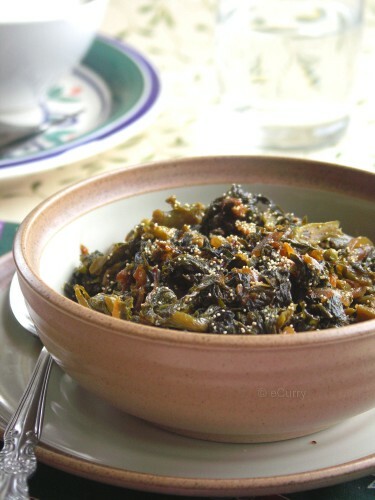 After looking at the picture of Malbar Spinach I think I remember that I have tasted it. My mom used to grow it in our house. But strangely enough i have never seen it here in the US. Loved the simple recipe with the greens. I know this green, good for mouth ulcer and even stomach. I only had in India, may be i should bring some seeds next time. Ur curry is different and tasty! I don’t think I have ever had anything made with these greens but they sound delightful and the curry looks really delicious ! WOW!! It’s called Poi there too! .. Is the Caribbean dish Callaloo made with these leaves? Oh… this with hot steamed rice, Nan- Oh goodness you have me salivating. I have never heard this before,sure looks pretty with poppy seeds! Should taste great !! I have never had these greens, why are they called Malabar greens? These grow in Kerala? Never seen this variety there, but it looks pretty and the dish looks delicious! I always learn something new when I visit here 🙂 Thanks! I’ve never tried this before but it sounds really delicious! For a second I thought this was the Hawaiian specialty. I’ll keep an eye out for this at the local Indian grocers. Is this a seasonal thing? What is the Hawaiian specialty? I have seen these available in the Indian Grocers during Spring & Summer, but i think they would grow all year round given some warm weather. I have mine in a pot indoors ( not enough to be cooked all year round) .. but they have survived. Now with the weather warming up, i have planted them outside. AH HA RE !!!! jodi eta aaj lucj a petam re didi !! !